Want your next presentation, direct mail campaign, or product launch to be remembered, effective, and produce sales results? Do it in True-Vue 3D! No longer do you need to rely on your imagination to experience depth. Now it's possible to show depth in inches, feet, even miles. 3D True Vue viewers allow the illusion of depth to wrap the viewer in a realistic three-dimensional environment that increases attention and retention of your message. With many styles, focal lengths, and number of views available, 3D TrueVue viewers will add dimension to your bottom line and depth to your advertising campaign! Our patented stereo viewers are available in two unique formats or create a custom design to fit all of your needs. How They Work: True-Vue 3D viewers are comprised of two images that may look identical but are actually made from slightly different points of view, simulating the way your eyes see distinct images.The illusion of depth is created when your two eyes see these distinct isolated images. This is called the stereoscopic effect. When you look into our stereo viewers, the patented 3D True-Vue viewers have a pop-up septum that blocks the left image from the right eye and right image from the left eye. The lenses magnify the image, to make you feel closer. WOW! Now that's pure 3D like you've never seen before! 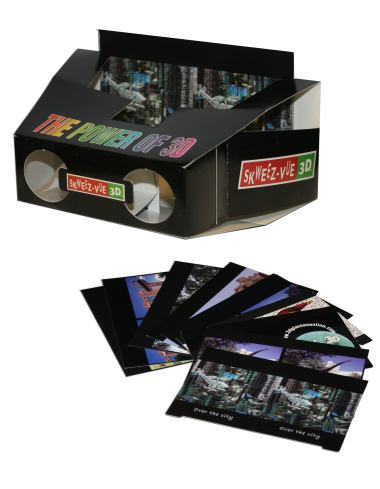 3D True-Vue stereo viewers are available with a single 3D image or interchangeable multiple 3D images. Let our 3D specialist transform photographs, art, transparencies, illustrations, or graphics into dramatic 3D stereo pairs. - Business announcements and MUCH MUCH More!